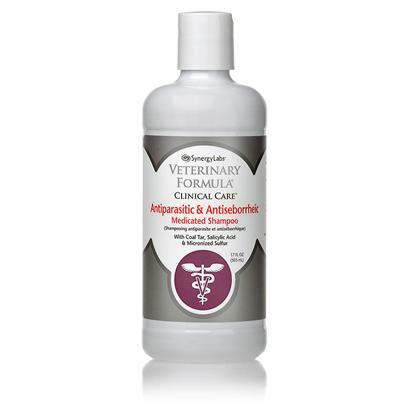 Veterinary Formula Clinical Care Antiparasitic & Antiseborrheic Medicated Shampoo treats Seborrheic Dermatitis. Seborrhea is a skin disorder that can be a result of bacterial or yeast infections. Seborrheic Dermatitis is also a genetic disorder. Veterinary Formula Clinical Care Antiparasitic & Antiseborrheic Medicated Shampoo relieves symptoms such as inflamed scalp, waxy or greasy skin, red skin rashes and scaly skin that is very similar to dandruff. It is not meant for use on cats due to its tar content. Avoid contact with eyes. If irritation such as swelling and redness persists discontinue use and consult your veterinarian. Wet your dog’s coat and apply Veterinary Formula Clinical Care Antiparasitic & Antiseborrheic Medicated Shampoo on your animal’s back. Massage Veterinary Formula Clinical Care Antiparasitic & Antiseborrheic Medicated Shampoo into your dog’s entire coat, you may require to use more of the product if you have a large or long haired animal, or if your animals infection is severe. Rinse well. Veterinary Formula Clinical Care Antiparasitic & Antiseborrheic Medicated Shampoo should be used 2-3 times within the first week of application for 12 weeks. Wash hands immediately after you finish the application.